On Saturday 4th August, four of the Oarsome boys made their merry way into the Suffolk countryside to the Sudbury 132nd International Regatta (“international” due to one Belgium sculler from Ghent apparently). We were competing in the Novice 4+ Jack Spurgeon Memorial Cup, a 650m sprint along the river Stour with a few challenging bends. Our first race was against a local Sudbury RC crew; it proved to be tight contest and at first we weren’t sure who had crossed the finish line first. We were happily informed that we piped them by ¼ length. Waiting for the semi-final, we had time to take in the fantastic facilities that had been laid on with a local jazz band providing the soundtrack to the day. One tent was showing the Olympics and the cheers of the rowing clubs for their own athletes on the Stour mingled with the roar when Team GB athletes crossed the line at Eton Dorney. 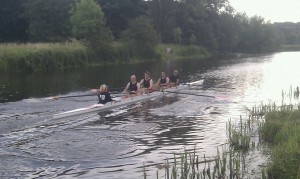 The time for our next competition soon presented itself to us., this time against a crew from Gravesend RC. A more composed start and settling into a nice rhythm meant we pulled away and won by a length. In the final we faced a novice crew from Broxbourne. From the start the two crews were evenly matched. Neck and neck for the for the first 10 strokes, but then Broxbourne headed into the bank. Our cox, wanting to give a good display to the crowds on the bank, kept us going to the end, but the contest was as good as over. 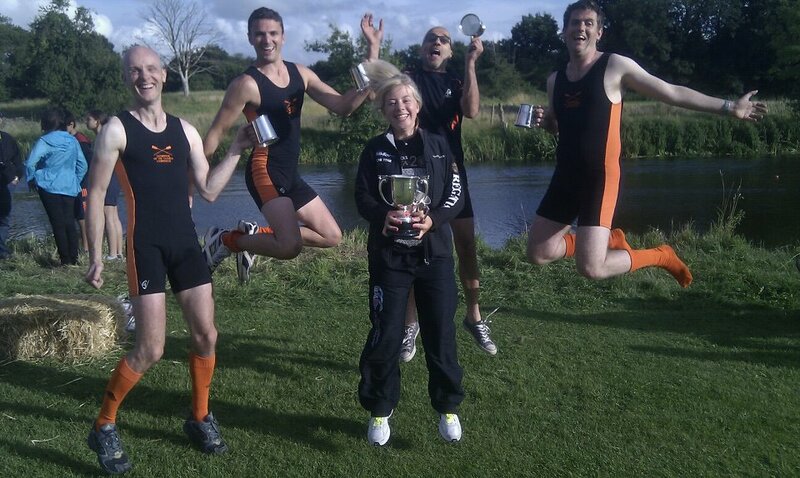 All that was left was to collect our tankards and pick up the first points of our rowing careers. I would highly recommend it for anyone that is interested next year as it’s a fantastic day out for rowers and spectators alike. A huge thanks to our coach Ali Davis for helping us get there and cheering us on from the bank and to our cox Megan who safely steered us round the bends that proved problematic to many other crews. This entry was posted in Race Reports, Uncategorized. Bookmark the permalink.